It is normal for women in their forties and early fifties to notice short-term memory loss becoming an issue. Once you spot the symptom, it's easy to jump to conclusions about memory-impairment diseases, such as dementia, but the majority of menopausal women facing short-term memory loss are actually experiencing “brain fogs”. Common during perimenopause, brain fogs affect a woman's ability to concentrate, adapt to routine, and absorb, process, and retrieve information. Keep reading to understand why sudden memory loss occurs during menopause, how to recognize brain fogs, and learn ways of managing the symptom. The brain's cognitive functions are closely linked with estrogen levels in the body. Estrogen activates memory-influencing areas of the brain, like the hippocampus, as well as other neurotransmitters, to stimulate cognitive processes. Estrogen also helps blood vessels to dilate, increasing blood flow to the brain to stimulate and enhance the cognitive functions. As a woman approaches menopause, estrogen production levels rapidly decrease, which affects the activity of the cognitive functions in the brain, causing sudden memory loss episodes. Menopausal memory loss is not as straightforward as simple forgetfulness, though forgetfulness is a symptom. The cognitive functions affect a number of processes in the brain that may not be immediately associated with memory, such as concentration, attention span, and the ability to adapt to changes in routine. Trust your instincts and look for clues. If you are struggling to take in new information and consciously recall it, having difficulty concentrating, or loved ones and colleagues have expressed concern or frustration, it is likely that you are experiencing brain fogs. Aerobic exercise. Working out for 30 minutes, five times a week is a great way to improve memory as well as overall health. Brain-training exercises. These could be anything that requires prolonged thought, engagement, and concentration, such as board games, card games, word puzzles, mathematic puzzles, or playing brain-training applications on your mobile device. It helps to be prepared for the onset of brain fogs so that your professional and personal relationships do not become compromised. Keep a pen and pad of paper handy so that you can take notes when receiving instructions or information; making notes in this way will reinforce information, and increase your chances of absorbing it, and it will also provide a reminder in case you do forget what you've been told to prevent you having to ask for it to be repeated. While sudden memory loss can be distressing and somewhat shocking during menopause, there is some comfort to be taken in knowing this is natural and biological; you are not losing any degree of your intelligence or personality. Remember, there are a number of diet and lifestyle adjustments that can be made to improve memory, so try to tackle the symptom head-on rather than letting it affect your well-being. 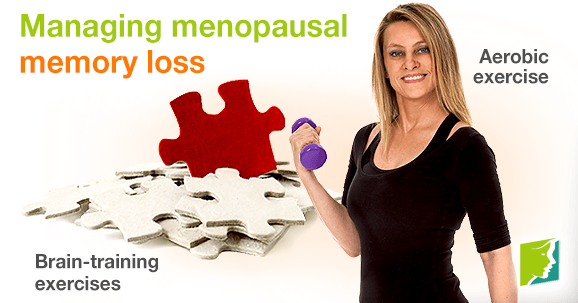 Read useful tips to avoid memory loss during menopause here. Don’t let brain fog become a more regular occurrence in your everyday life. Postmenopause and memory loss are closely related, as decreased estrogen levels can affect the brain. However, dementia is more severe. Learn about it here. Black cohosh is an herb used to naturally treat menopause symptoms, including memory loss.